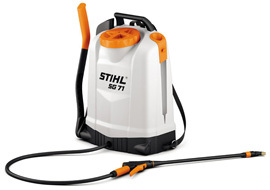 A portable backpack sprayer for professional applications. Maximum Working Comfort by pumping lever mounting right or left, and latitude and longitude adjustment. High-quality belts and molded back panel for comfort. Ergonomic shutoff valve with pressure gauge.